It might seem counter-intuitive, but brining any cut of meat can make it significantly juicer and more tender. How? The brine increases the amount of moisture in the meat, allowing more of it to remain in the pork as it cooks. While some cuts can benefit from long brining times (up to 24 hours or more), even an hour of brining can produce a markedly moister, more flavorful pork chop. Various seasonings can be added to the brining mixture to enhance the taste, but use restraint and allow the natural flavor of the pork to shine through. Mix the brine ingredients in a large mixing bowl, stirring until they are dissolved. Place the pork chops into a heavy-duty plastic zip lock bag. Pour the brine over the chops, squeeze out as much air as possible and close tightly. Marinate for at least 1 hour, turning once. Whisk together the glaze ingredients in a small bowl and set aside. Remove the pork chops from the brine and discard marinade. Pat dry and brush lightly with oil. Prepare a charcoal or gas grill. If using a gas grill, pre-heat to medium high, about 450 degrees. 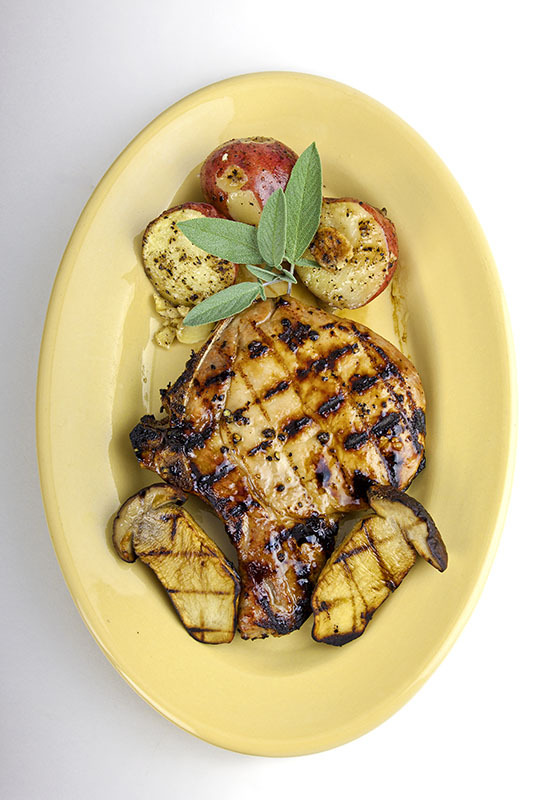 Put the chops on the grill and cook, turning twice, about 8 – 10 minutes total per side. Brush each side with a little of the glaze after turning. When the chops are cooked to desired doneness, remove from the grill and let them rest for a minute or two. Put on serving plates and drizzle with the remaining glaze.